Recorded live April 2nd, 2013, at The Lily Langtry Room, Lamp Tavern, Birmingham, by Christopher Trent. Mixed by Christopher Trent, mastered by Olaf Rupp. Graphic Design by Carlos Santos. Produced by Ernesto Rodrigues. Combine Frank Paul Schubert (soprano saxophone), Matthias Müller (trombone), John Edwards (bass) and Mark Sanders (drums) and you have the Foils Quartet. Play their album and you enjoy some excellent improvised music. Originally Müller and Schubert worked as a duo, named Foils, before inviting Sanders and Edwards. Sanders and Edwards have a long history as the rhythm section of Trevor Watts and Evan Parker units. Müller is a Berlin-based improviser but also plays a role in the new music scene, especially as a member of the Echtzeit scene( Kai Fagaschinski, a.o.). Frank Paul Schubert is also involved in improvisation and contemporary jazz. Coming from the Aachen-area he played with many, mainly German musicians (Willi Kellers, Johannes Bauer, Alexander von Schlippenbach). So a German-British collective that excels in very communicative improvisations. What a joy to listen to! Never a dull moment here. Throughout they play intense and concentrated on a continuous high level. Thrilling playing by Schubert, what a player. They unfold their ideas in two lengthy improvisations: ‘Eddie’s Flower’ and ‘Amaryllis Belladonna’. Recorded live on april 2nd 2013 in Birmingham. ‘Eddie’s Flower‘ takes more than 50 minutes but is worthwhile from beginning to end. A real tour de force. The instruments make a nice colour palette. Especially through the combination of trombone and sax. It is above all the constant stream of musical ideas that make their interplay very rich and fascinating. Quite and subtle textures change for high-energy battles. Totally gripping music, emotional as well as cerebral if this distinction is of any meaning. This avalanche in the canyon of free jazz comes from a musical liaison between Germany and UK, the favourable meeting between the excellent wind Berlin-based duo by Frank Paul Schubert, whose empathy with his soprano saxophone and the other elements of the band has a dynamite shape on this record, and Matthias Muller on trombone, and John Edwards (bass) and Mark Sanders (a real octopus on drums! ), two brilliant improvisers from the vibrant English scene. This fourtet gave rise to two impressive sessions of so instinctively head-banging and constantly spinning free-jazz that you might wonder what kind of power pill they swallowed to blast their musical energy: the two impressive sessions on „The Jersey lily“ – „Eddie’s Flower“ and „Amaryllis Belladonna“…two clear references together with the title of this release to Lille Langtry, the most beautiful European woman according to Oscar Wilde’s words…an opinion which could be reasonably agreed by King Edward VII, maybe the most important and „earnest“ (!) of her many suitors – sometimes sound like a proper battle between the two duets (Bass Vs Drums and Trombone Vs Soprano Saxophone! ), which scrambled their instruments by means of an overwhelming roller coaster of sounds, techniques and musical scuffles for more than 75 incendiary minutes that got recorded live on April 2nd 2013 at The Lily Langtry Room, Lamp Tavern, Birmingham, UK by Christopher Trent. Berlínští dechaři – saxofonista Frank Paul Schubert a trombonista Mathias Müller – vystupují v duu od roku 2008 a jejich symbiózu plně vystihuje album Foils (FMR) z roku 2011. Spolupráce londýnské rytmické sekce – John Edwards (basa) a Mark Sanders (bicí) sahá až do roku 1990, společně vystupovali a nahrávali například s Evanem Parkerem nebo Veryanem Westonem a v posledních letech mimo mnohé jiné tvrdí muziku s formací The Remote Viewers. Jejich niterné souznění pak dokumentuje CD Nisus Duets (EMANEM) z roku 2002. V roce 2011 se tyto dvojice rozhodly své nezměrné síly propojit a Foils Quartet byl na světě. Záznam jejich koncertu z Lily Langtry Room z Lamp Tavern v Birminghamu z 2. dubna 2013 daný potenciál jasně potvrzuje. Muzikanti se s tím od počátku prostě nemažou a jejich první dvaapadesátiminutová instantní kompozice Eddie´s Flower není rozhodně procházkou růžovým sadem, ale spíše skokem do jícnu vybuchujícího vulkánu, kde si jen těsně po třinácté minutě na chvilku odpočineme v nějaké zvukové skulině, kam onen rachot doznívá ve zpomaleném tempu. Horečnatý stav ještě umocní po třiadvacáté minutě ďábelsky rozvrzané kontrabasové sólo. Zhruba před třiačtyřicátou minutou se vytratí rachotivá bubenická smršť a frenetické kvílení saxofonu se postupně změní v dýchavičné zajíkání a až po jímavé lkaní, k němuž se přidá i naříkavě truchlivý trombón. Pozvolna to ale zase nabírá grády a začíná se rozmělňovat v chaotickém reji, který přes četné mikroperipetie ústní nakonec do relativně chlácholivějších poloh. Druhý kus má přes opět poetický název Amaryllis Belladonna děsně nervní intro a drásající i plíživá ataka tentokrát prakticky neutuchá ani po dvacáté minutě, kdy se vše nádherně zvrhává v jakési ladění, dolaďování či rozlaďování. Ale pokud nepropadnete panice, je možno se do tohoto zběsilého poskakování vnořit a rezonovat s ním. Opravdu nářez non plus ultra, který ovšem koření spíše z evropské kakofonie než divošského jazzu. The Jersey Lily documents the wind duo of Frank Paul Schubert & Matthias Müller, the Berlin improvisers expanding to a quartet in England with John Edwards & Mark Sanders. The result is classic „FREE“ jazz, invoking a kind of transcendence within skepticism (as Clayton Thomas puts it in a discussion of the similar Life in a Black Box, which I discussed here in October, and which made its way onto some „best of“ lists). This sort of music is rather the opposite of reductionism, and one might think, restraint. Another album to compare is Live in Madrid, also featuring Schubert with a trombonist, but with more structural pivots. 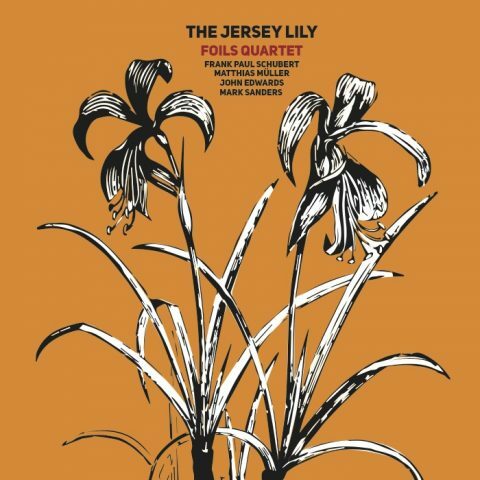 The Jersey Lily can seem kind of long, but it’s a very active album, including soloing & motivic development that listeners who enjoy the classic free style will likely appreciate. […] Anything but preventative sounds, the band consists of four youngish Free Jazz veterans: trombonist Matthias Müller and soprano saxophonist Frank Paul Schubert from Germany and bassist John Edwards and drummer Mark Sanders from the United Kingdom. Na ekskluzywny finał tej dość skromnej prezentacji muzycznych dokonań Matthiasa Müllera, prawdziwa energetyczna petarda, skumulowana w czterech głowach i czterech akustycznych instrumentach, o charakterystykach w pełni atomowych. Czyli Foils Quartet! Pięć kwadransów niebywałej, free jazzowej erupcji muzycznych emocji! Dwa traki i pięć milionów wrażeń w wymiętolonym kajecie recenzenta. Free jazz z inklinacjami do współczesnej sonorystyki, a nawet nieco wulgarnie pojmowanej kameralistyki. Puzon i saksofon sopranowy w zderzeniu z sekcją, która gotowa jest na każdy przebieg zdarzeń. Dęciaki, mieniące się wszelkimi barwami współczesnej muzyki improwizowanej, są tu eksplozywnie korpulentne i dosadne, tak w działaniu, jak i brzmieniu. Potrafią także przyjmować pozy uroczych nastolatek, buszujących w zbożu i gotowych na każdą ewentualność. Ich niebywała wszechstronność, tak gatunkowa, jak i instrumentalna, prowokuje niezliczone zaskoczenia dramaturgiczne, w których jednak fenomenalnie odnajduje się angielska sekcja rytmiczna. Gra Schuberta godna jest muzyków, którzy także nosili i noszą takie nazwisko. Ciekawie w tym wrzącym tyglu wyzwolonych emocji, odnaleźć można poczynania Müllera. Znów niełatwy w użyciu, duży instrument blaszany jest w jego rękach zwinny i przebiegły, zdolny do generowania każdej dźwiękowej układanki. Sam muzyk świetnie wyczuwa działania partnerów, wchodzi w intrygujące dialogi i zawsze ma pomysł na interakcję. Zresztą te cechy charakteryzują każdego z członków tego – zapewne – jednorazowego kwartetu. Oni grają tak, jakby całe życie muzykowali tylko w tym układzie personalnym. Symbioza ta jest molekularna, pełnowartościowa i trwała. To niechybnie cecha muzyków wybitnych. Gwoździem programu tej doskonałej płyty są epizody puzonisty w parze z niebywałym Johnem Edwardsem. W każdej części płyty jest jeden taki duetowy popis (choćby okolice 25 minuty Part One). Warta podkreślenia jest także sama produkcja koncertu. Nawet w ekstremalnym nawałnicach free, brzmienie instrumentu każdego z muzyków jest czyste i selektywne, co dodaje nagraniu kolejnego mega splendoru.